Daniel Murray celebrates his game-winning kick that stunned Penn State in 2008. Last year on November 8, 2008, the perfect Penn State Nittany Lions came calling at Kinnick Stadium in Iowa City hoping to secure a shot at the national championship as one of the teams in the creme de la creme BCS Bowl in Miami. Unfortunately for them the Iowa Hawkeyes had another scenario in mind. The Nittany Lions needed this victory to continue the season undefeated. Penn State was already grumbling about the possibility of not receiving the call to play in Miami even if they were undefeated at the end of the season. With a year of experience Terrelle Pryor could emerge as one of the top players in the Big Ten. 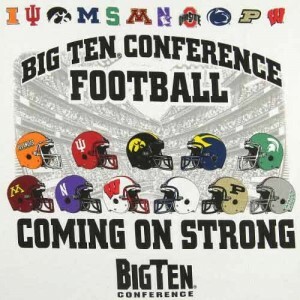 Overview: Once recognized annually as one of the strongest conference in college football, the Big Ten has taken a reputation hit in recent years with the poor showing of its top teams in bowl games. Last season the conference was 1-6 in bowl games with only Iowa pulling out a victory. Ohio State and Penn State start the season ranked in the top 10, but the conference must have some strong early non-conference victories if they hope to have a squad seriously considered for the BCS Championship Game.